← RECOMMENDED: Leese-Fitch 2009 Merlot (87% Merlot, 13% Syrah), California. 13.5% ABV. Generally $8.99-10, available for as little as $7.75 (http://vinobazaar.com/red-wine/merlot/leese-fitch-merlot-2009/). Three of us tasted this beauty, and all of us were stunned that a Cab this young (and inexpensive!) could possibly be this complex and delicious. Turns out there’s a reason: while it is indeed mostly Cab, it is in fact a beautiful blend. In the U.S., a bottle of wine can be labeled as a varietal, i.e. Cabernet Sauvignon, as long as it consists of 75% or more of that particular juice. This wine definitely wears the Cabernet mantle handsomely, but its complexity reveals that there’s a lot more going on than Cab. Sure enough, although the label says simply “Cabernet Sauvignon,” the tech sheet shows 79% Cab with 6% Alicante Bouschet, 5% Cabernet Franc, 4% Merlot, 4% Syrah, 1% Carignan, and 1% Petite Sirah. This beauty was ruby-garnet with pink edges. A few tiny wine crystals graced the glass. Time to taste. Oh, yum! To me, at first it had a slight medicinal edge, but rapidly molasses, toasted oak, red raspberry, black cherry, and dark chocolate took over. With the second glass, threads of tea and orange meringue emerged, with layers of coffee and leather. This complex beauty had very soft tannins and not much perceived acidity. It was smooth, round, and well-balanced, with a lovely silky mouthfeel that expanded into a lingering yet gentle finish. All of us enjoyed the feelings and associations we felt and remembered. As a woman, I was interested in not only the deep enjoyment but also the sheer respect the men showed toward this wine which I experienced as “pretty” and “feminine.” The memory of the whole evening makes me smile. FRONT LABEL: Across the plaza from Leese-Fitch Adobe is the Mission San Francisco Solano. Built in 1823, it is one of the oldest and most historic buildings in Sonoma, the final stop of El Camino Real, “The King’s Highway” that connects all 21 of California’s Franciscan missions. This entry was posted in Alicante Bouschet, Cabernet Franc, Cabernet Sauvignon, California, Carignan, Merlot, Petite Sirah. Bookmark the permalink. 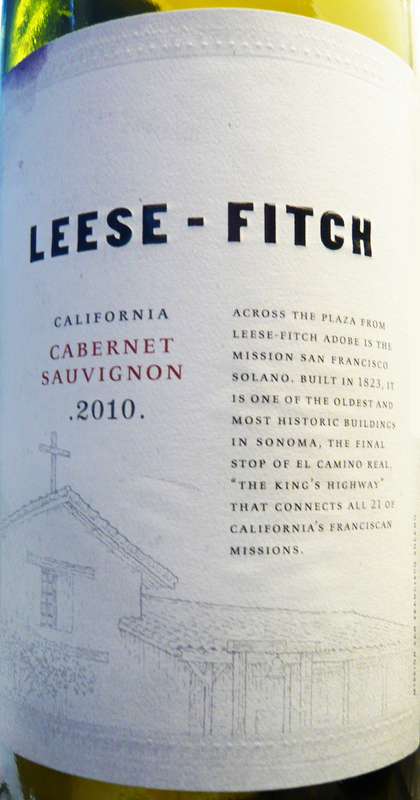 8 Responses to HIGHLY RECOMMENDED: Leese-Fitch 2010 Cabernet Sauvignon, California. 13.5% ABV. $9.99. Glad you liked it as much as we did. TOG (The Other Guys) does a great job with their wines. I had a very good wine last weekend while visiting the Highlands , North Carolina area. The wine was very tasty and as I said , very good. Problem is , I do not remember the exact name. It was a Leese Fitch and I believe a Pinot blend ( 98% pinot and 2% merlot? ) I live in Alabama and want to try to find it locally. Can you help ? Ron, you had the 2010: http://www.togwines.com/wines/leese-fitch/2010-california-pinot-noir.html The 2011 blend is much different: http://www.togwines.com/wines/leese-fitch/2011-california-pinot-noir.html Try your local wine shop, or go to http://www.wine-searcher.com — you can order it online for as little as $7.75! Amazing wine for about $10 retail. Best wine I’ve ever had at this price point. sit gathering dust in my “wine cellar”. It is almost as consistant from year to year as Cocoa Cola! Now, if only the Guenoc Petite Sirah was as inexpensive….. Wish I could agree with you but my experience has been negative. Although the first bottle I had (which was probably a 2010) was fine, the second (which I believe was a 2011) had turned. I contacted the distributor who kindly compensated me with two 2011 bottles. Unfortunately, when I opened each of these bottles, I could hear gas escape and both had turned. Their unique plastic wrap-around cap is supposed to avoid this problem but it didn’t work in my case. I don’t mind getting the odd bad bottle but at this rate I can’t afford to take another chance on Leese-Fitch. This wine is bring served for happy hour at the Redwood Grille in Santa monica. I immediately got online to read about it. I’m ordering a case. It’s invelievable!! Yes, I’m happy this hour.